Ok so, there’s no real name to the method. It’s something that a lot of people are using, becoming more and more popular in the recent years, purely because of its effectiveness and how easy it is. Personally, I call the method “Engagement Marketing” or “Viral Marketing”, you may also hear it referred to as “Signaling”. Basically, this method works on 3 stages. Whether this is on a personal or business Facebook page, a twitter feed or even a blog post; whichever social network you have chosen, this method will work. Providing you have a relatively sizeable audience, although this method can be used to develop and grow an audience or community! Incentivising: You need to give people a reason to create a reaction. For example, a reaction on Facebook would be a comment, share or like. The main key to this is making sure you keep it simple and easy, you don’t want to tell them to do too much; because let’s face it, they probably won’t do it. I’d aim to pick around 1 – 2 reactions, depending on the size of the incentive. Like: Shows the person you’re interested in that content, will sometimes show on your friends wall saying “Bob Liked this, maybe you’re interested?”. Comment: Slightly more engagement, higher chance of the post displaying on your friends wall. Similar to a like it will display saying “Bob commented on this post”. Share: The most effective way to make a post get more views, this will take the post and put a copy on your wall. Whenever someone clicks on it, they will re-direct to the original post. Great way to build traffic. Act On The Reaction: Now that you’ve given the person incentive and captured their reaction, all you have to do is act accordingly. If you asked them to comment, follow up by replying to each of the comments individually; show that you’re interested and really care for each of them. This will also send another notification to keep the user engaged in the content. If you’ve asked someone to share for example, you could go to each of the shared posts and simply put a comment saying “comment on my post if you’re interested!”, another way of showing the people that you’re truly trying to help them. Engagement: The main way that this process works is down to the peoples engagement. That’s typically how things go viral. One person will make a post, all of their friends will comment, like and share the post. Resulting in their friends seeing the post and doing the same. This will echo and keep getting repeated until suddenly thousands of people have seen your post! Following the method: This 3 step method, will work for pretty much anything! Let’s say for example; you’re a brand, a hairdresser or even own a beauty parlor. You will have a service that you want to sell the your customers to help your business run smoothly, right? Let’s pretend we own the brand. You have a load of product stocked up, but not getting any sales, you need a way to get the audience involved. So you decide to host a giveaway. Nothing major, just a pair of latest edition shoes. The giveaway itself will be the incentive for the people, who doesn’t love free stuff? The next thing you’ll have to decide is the reaction you’re wanting to capture. If you’re struggling in sales, you probably need to drive more traffic to the website, so you decide you want the people to “Follow” your promotions page. By doing that they enter themselves into the giveaway. So now you’ve Incentivized, gave the people a reason to react. The users have reacted, doing exactly what they were asked. The next thing to do is follow up with the post. Giveaway the product as promised, you can even make another post showing the winner. This can then be used to drive even more traffic, by simply putting “Follow to be in for a chance of winning the next!”. 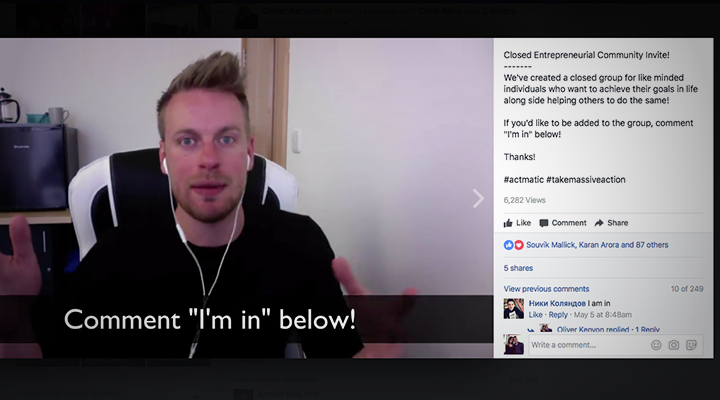 I recently did a post on my personal Facebook page, the motive was to grow our private entrepreneurial community (Actmatic), if you’re interested in becoming a part of the community here’s the link. The post went really well, within the first 12 hours reaching up to 6,000 total unique viewers and hundreds of comments. This was all done with free viral engagement traffic, no ads, no promotion. All traffic was generated from the post. Incentive: Give the people a reason to get involved, create an offer that they can’t refuse. But remember, don’t make it too hard! It’s needs to be simple enough that the process can be completed in at least a minute. We told the people that we’re inviting people to a Closed Entrepreneurial Community. Tell them a little about the group, give them a reason to want to join. For this post the incentive was in 2 forms; The video, and the description. This gave the ability to reach out to people that possibly can’t watch the video. Reaction: Capture the persons reaction, telling them to do something to show that they’re interested in joining. In this case; it was done by getting them to comment “I’m In”. As mentioned before, you can ask them to react in more than one way, however, the harder you make the reaction for the user the less likely they are to do it. Act: Go through the comments or your chosen reactions, and get in contact with the people. This will said through a new notification and keep the people engaged. I actually went through each individual comment, replying with “PM Sent”. Reflecting on this post and seeing the engagement that you can achieve is truly amazing and not a single penny was spent on ads or promotion. You can see in the image above, the post has reached almost 6,200 unique people. With almost 100 likes and 250 comments. In a 24 hour timeframe, you have potential offered your business or brand to 6,200 new people! This post in total took me about 5 minutes to put together and post and in that time, look at the numbers that were achieved. To summarize, you should always remember the 3 golden rules: Incentivize, Capture a reaction and Act on the reaction. If you manage to master these steps, you’ll be on your way to build free viral traffic in no time at all.